Joe Köller has gone missing in Proteus. It’s relaxing, they said. It’s refreshing, they said. It’s a walk in the park, they said. And I just had to take their word for it. Why? Why did I have to listen? Look at me! I haven’t slept in days, I haven’t eaten in days, I haven’t even touched another game in days. All because of their meditative little nature simulation: Everywhere I look, I see only its vibrant colors and adorable critters, taunting me with that sublime arrangement I have yet to find within the constraints of its cruel, random nature. Did you know some people don’t even consider Proteus a game? I can only assume they are joking: This is by far the most challenging, painful, torturous game I have ever played. In their satirical articles, these comedians pretend to mock the game for lacking objectives and meaningful interaction. It’s quite an elaborate ruse. 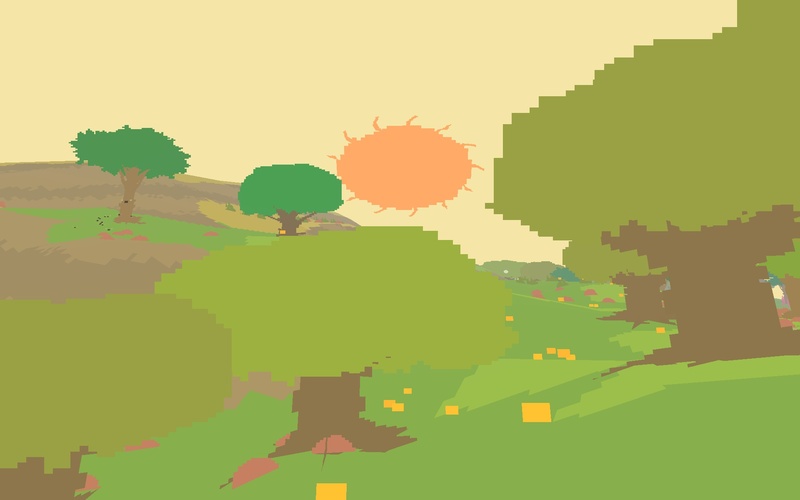 Of course Proteus has an objective: aesthetic pleasure. What objective could possibly be more noble than pursuing beauty, and what interaction more meaningful than to gaze at it, absorb it, let it speak to you? Only, do you know how hard it is to find beauty in this world? Oh, not at first. It’s all very beautiful at first, the little animals, the trees, the clouds, the colors. But by being wholly picturesque, Proteus spoils you. Soon islands that are merely pretty will no longer do and you go looking for one that is not just beautiful, but breathtaking. The one island with just the right combination of colors and sounds, the ideal arrangement of trees, clouds and animals dotted over impeccable topology. You start searching for the image your mind created as you read that sentence: the one, perfect island. I’m starting to think it doesn’t exist. It must, somewhere within the myriad of potential landmasses hidden in Proteus’ procedural algorithms, but what are the odds of finding it, really? Not that it matters. So long as it’s out there, or might be out there, I cannot rest and I cannot accept substitute pleasures. This one? Too flat. This one? Too rugged. This one? Too symmetrical. None of them ever live up to the lofty standard I have set and I have long since stopped spending more time on any one of them than is absolutely necessary to grade its looks. That’s all the time I can afford these subpar artworks if I mean to continue this quest for perfection. Maybe this is why Minecraft gives you tools? I used to think that it was simply a way to keep players busy, to play to their narcissism and possibly their obsessive compulsions by allowing them to colonize and structure the space surrounding them. Maybe it’s a necessary coping mechanism though, a way of dealing with the endlessly disappointing possibilities of this Impressionist generator. Unable to improve the game’s creations, you can only stare at their flaws, shudder and recoil. Without the means to craft perfection, all you can do is chase that elusive dream. Perhaps Minecraft is entirely the wrong comparison. This is no innocent little sandbox full of diversions and distractions. It’s a frustrating meditation on inadequacy and ugliness that gives you a deceptively simple goal, but not the means to achieve it. It’s Slender, only with roles reversed so you are endlessly chasing instead of fleeing. It’s visual horror, aesthetic splatter, art gore, and it has trapped my anhedonic mind in an endless loop of terror. Well, not entirely. Sometimes, sometimes I find a spot that’s just close enough to the picture in my head to stop my shaking and frantic breathing for a while. I’d sit down and, just for a minute or two, wonder if maybe this is good enough. If maybe this will do, even though that slope is not quite right, the trees are too far off and there are no critters to be found. Those wonderful clouds are drifting away and the sun is going down, but I could go find this island’s magical circle of time travel and see if the vista works better in a different season. Or I could stop. If I accept that the not-quite-perfect will do, there’s all manner of flawed beauty in my life already. Novels, films and games are just piling up. I got articles to edit, conversations to lead and actual, real walks in parks to take. Fresh air to breathe. I could spend an afternoon just lying in the sun and not worry about anything. Let perfection find me instead. Or I could try again. Maybe this time it’ll be different. Maybe this time it’ll be right. Joe Köller is the current Editor-in-Chief of Haywire Magazine, German correspondent for Critical Distance, and irregular contributor to German sites such as Video Game Tourism, Superlevel, and WASD. You can follow him on Twitter, and support him on Patreon.